This was a particularly hairy problem. There's an error message that shows up whenever you open a database with embedded code. It says "A potential security concern has been identified." Followed by a warning in bold. "It is not possible to determine that this content came from a trustworthy source." But they forgot one key thing. This is the only way I got this to actually work on my Windows XP test machine. Note the VBAWarnings key above? 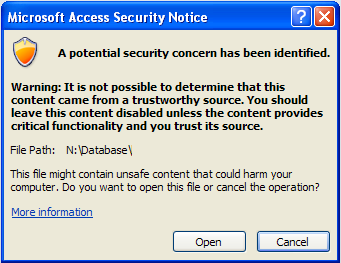 That is the deciding factor for Access 2010 Runtime to not show the warning message box on my Windows XP test machine. Your mileage may vary. 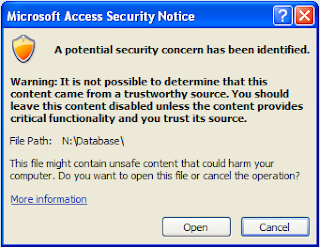 The AllowNetworkLocations key will allow it to apply this to files stored on a windows share. Due to the experience showed in this article, I would never use Access for my business deals. Fortunately, there is a solution for such kind of issues. I read in a virtual data room review that this service can easily be a platform to perform all necessary business operations. Thank y for this scripts, its very useful, keep going.